The starry ceiling was one of the artistic marvels of New York’s Grand Central Station when it opened in 1913. 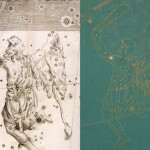 The constellations are based largely on Johann Bayer’s star atlas Uranometria (1603), which is the first Western atlas to cover the entire celestial sphere. Astronomically the Grand Central atlas is reversed from East to West and it was widely believed to be a mistake made when the artists transferred to the ceiling the draft provided by Columbia University’s Harold Jacoby, professor of astronomy. While some had argued that this corresponded to the ancient practice of representing the Heaven from without instead of from within, a commemorative postcard which is supposed to represent the original design indicated that the constellations were indeed painted backward. The atlas contains also a number of additional quirks which are of historical and general curiosity: (non-)reversion of Orion, the Triangulum Minus (non-standard constellation) was added during the 1945 restoration, and the hole above Pisces left from the time when the Redstone missile was exhibited in the Main Concourse in 1957, after the Soviet Sputnik was launched in the same year. 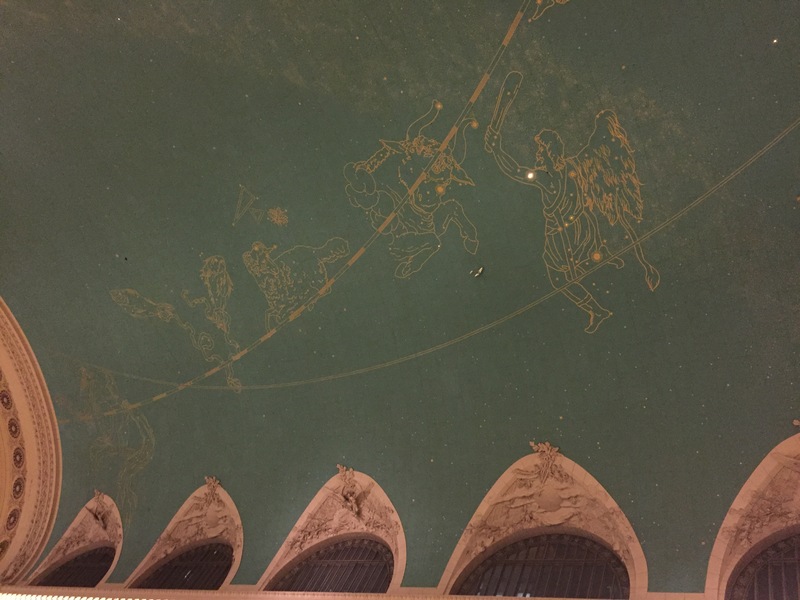 Photos 1: Grand Central Terminal celestial ceiling. 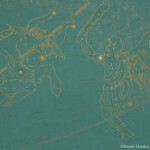 The ceiling shows “left-to-right” from Aquarius to Cancer (here only to Orion, below Taurus).